Pikachu Belle in game: 2,051 Who? Important notice! 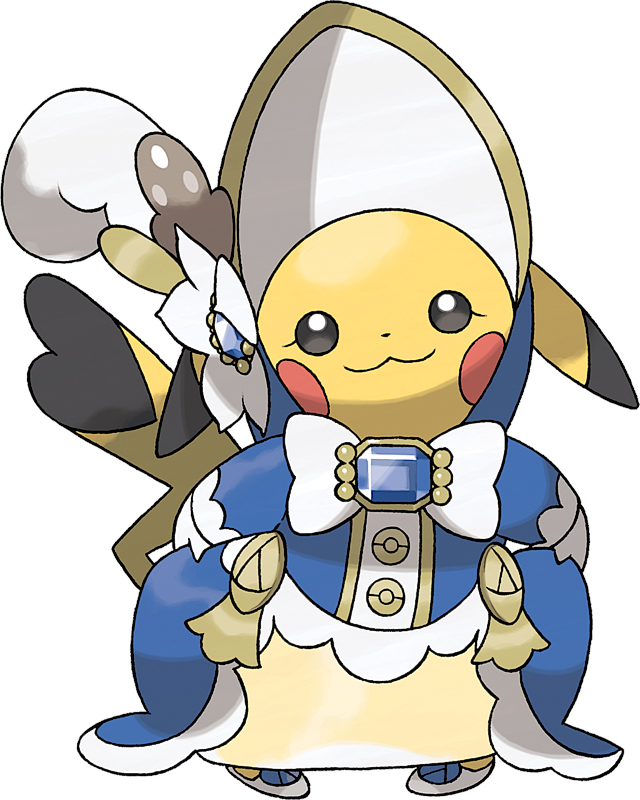 Pokemon Pikachu Belle is a fictional character of humans. 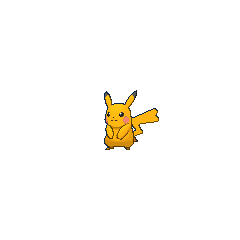 Pikachu is a short, chubby rodent Pokémon. It is covered in yellow fur with two horizontal brown stripes on its back. It has a small mouth, long, pointed ears with black tips, brown eyes, and two red circles on its cheeks. There are pouches inside its cheeks where it stores electricity. It has short forearms with five fingers on each paw, and its feet each have three toes. At the base of its lightning bolt-shaped tail is patch of brown fur at the base. A female will have a V-shaped notch at the end of its tail, which looks like the top of a heart. It is classified as a quadruped, but it has been known to stand and walk on its hind legs. Pikachu is able to release electric discharges of varying intensity. Pikachu has been known to build up energy in its glands, and will need to discharge to avoid complications. It is also able to release energy through its tail, which acts as a grounding rod, as well as recharging fellow Pikachu with electric shocks. Pikachu can also electrify itself to use its signature move Volt Tackle. When threatened, it looses electric charges from its sacs, and a group can build and cause lightning storms. 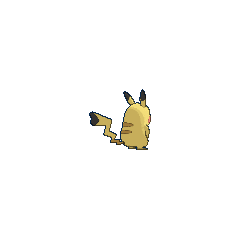 It is found mostly in forests, where a sure sign that Pikachu inhabits a location is patches of burnt grass. In Mewtwo Strikes Back, Mewtwo clones Ash's Pikachu. This Pikachu can be told apart from Ash's due to spikes on the black marks at the tips of its ears. It is also comparatively more aggressive than Ash's Pikachu and slurs its speech, defects possibly caused by Ash tampering with Mewtwo's cloning machine during the cloning process. Multiple Pikachu, including all of the Cosplay Pikachu appeared in Lights! Camera! Pika!, under the ownership of Frank. 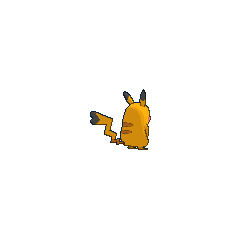 A Pikachu also had a part in Pokémon Mystery Dungeon: Team Go-Getters out of the Gate!. He was kidnapped by a Skarmory and Team Go-Getters set out to rescue him as their first mission. Pikachu provided them with some items in the battle. 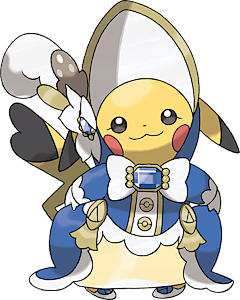 A female Pikachu appeared in SS027 under the ownership of Ayumi. A Mirror World Pikachu appeared in The Cave of Mirrors!, under the ownership of Mirror Ash. Multiple Pikachu appeared in Hoopa and the Clash of Ages, including the cameos of the Cosplay ones. A Pikachu, named Spike, appeared in Battling at Full Volume!, under the ownership of Jimmy. Numerous other Pikachu appeared in Pokémon Emergency! belonging to Nurse Joy to help Ash's Pikachu defeat Team Rocket's Jessie, James, and Meowth to send them blasting off for the first time. They reappeared in a flashback in Pikachu's Goodbye. 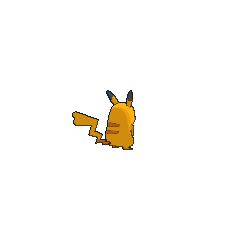 Wild Pikachu were also prominent in Pikachu's Goodbye, where Ash considered releasing his own Pikachu so he could be with his own kind. A Pikachu has also been owned by Luana's son, Travis. Luana mistook Ash for Travis when she saw Pikachu on Ash's shoulder. A Pikachu appeared in Lucario and the Mystery of Mew as a transformation of Mew. A Pikachu named Sugar belonging to the owners of a restaurant went missing prior to Cooking up a Sweet Story!, and Ash's Pikachu had to fill in for it so that its owner would have the confidence to win a cooking competition. At the end of the episode, Sugar returns, however, it has evolved into a Raichu. A Pikachu that belonged to an unnamed Aura Guardian appeared in a flashback in The Keystone Pops!. 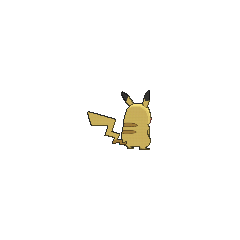 A Pikachu appeared as a mask for the festival in Capacia Island UFO!. A Pikachu appeared in Alexa's magazine in The Journalist from Another Region!. 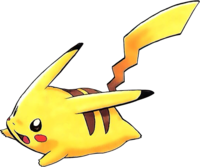 A Pikachu appeared in a fantasy in To Catch a Pokémon Smuggler!, evolving into a Raichu using a Thunder Stone. Red caught a Pikachu in The Adventure. A Pikachu appeared as a silhouette when Green explains about Mew in The Jynx Jinx. In Just a Spearow Carrier a Pikachu appeared with its trainer at Indigo Plateau, it noticeably has a flower by its ear. A Pikachu is seen in The Kindest Tentacruel where it was one of the Pokémon that Yellow was fantasizing about that was able to evolve via stone. Another Pikachu appeared in Can You Diglett? as a silhouette when Agatha and Lorelei explains to Red about how Pokémon and people can't coexist with each other. A Pikachu appeared in a fantasy of Professor Elm's explanation of Pokémon eggs in Teddiursa's Picnic. Another Pikachu appeared in Ursaring Major where it appeared in a fantasy of Silver when he explains about the vital points of Pokémon. In Tyranitar War, Yellow is seen to have a new addition to her team: a Pikachu of her own nicknamed "Chuchu", that she had found injured in Viridian Forest and nursed back to health. When Pika is left behind by Red on his trip to Mt. Silver, Pika joined Yellow and Chuchu on their adventure to Johto. Wild Pikachu appeared in Suffering Psyduck. 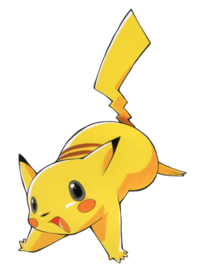 Multiple Pikachu were also among the Electric-type Pokémon that charges the Prism Tower during a blackout in Pangoro Poses a Problem. Five Pikachu appeared in Omega Alpha Adventure 3, being Cosplay Pikachu they each wear the five costumes available; being Pikachu Rock Star, Pikachu Belle, Pikachu Pop Star, Pikachu Ph. D. and Pikachu Libre. Lisia reveals to Chaz that Ruby composed the concept of Pokémon wearing costumes for Contests. Noticeably there are several males, and at least Pikachu Pop Star has the black marking on the tip of her tail. A Pikachu makes a cameo in Pokémon Battle Frontier during one of the battles. Also, a photo album owned by Anabel has a Pikachu on the cover. 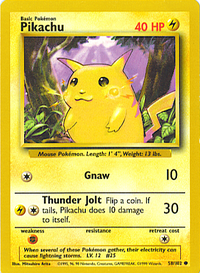 Pikachu somehow manages to find its way into many of the expansions, causing there to be 108 known non-reprint Pokémon cards featuring Pikachu. There are also various Trainer cards with Pikachu in the card's artwork too, including the very sought-after tournament promos such as No.1 Trainer. 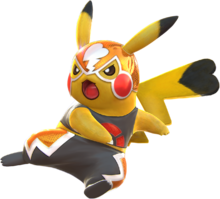 Pikachu is a playable character for the arcade fighting game. Its moveset is comprised of electrical attacks it uses in the main games, like Thunderbolt, Electro Ball, and Thunder. In Burst form, it can use the Burst Attack Volt Shock Fist. Several of its attacks and victory poses are directly taken from Heihachi and Kazuya Mishima's movesets from the Tekken series. 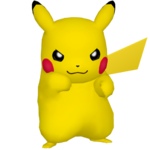 Pikachu appears as the player character in both PokéPark Wii: Pikachu's Adventure and its sequel, PokéPark 2: Wonders Beyond. He falls down a mysterious tunnel one day with his friends Charmander, Chikorita, and Piplup and ends up in the PokéPark. There he goes on an quest to save the PokéPark from certain destruction. He later travels to a new PokéPark which is being threatened by the ever expanding Wish Park. At the new PokéPark he meets Snivy, Tepig, and Oshawott, and they help to save the PokéPark from danger. Can replace many disruptions with this Pokémon. Niue released a one-dollar coin featuring Pikachu as part of a commemorative promotion for the Pokémon franchise, with Pikachu on one side and the nation's coat of arms on the other. 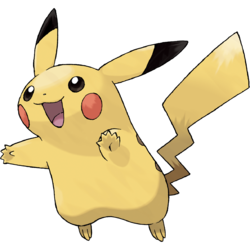 Pikachu and its evolved form share their category with Rattata, Raticate, Sandshrew, and Sandslash. They are all known as the Mouse Pokémon. Veronica Taylor has stated that Pikachu is her favorite Pokémon. Sarah Natochenny has said it was her favorite as well, along with Mew. In 2008, Japanese researchers discovered a new protein that helps carry electrical impulses from the eyes to the brain and named it pikachurin. According to the researchers, the decision was based on both the Pokémon and protein possessing "lightning-fast moves and shocking electric effects". There have been three Pikachu balloons in the Macy's Thanksgiving Day Parade. The first, known as the "Flying Pikachu" was flown from 2001 through 2005. It was used in a morning rush hour test of wind conditions in Times Square after an accident involving an M&M's balloon in the 2005 parade and made its farewell appearance at the Party of the Decade in August 2006, in New York City's Bryant Park. The second version debuted in the 2006 parade, features glowing cheeks, and chases a Poké Ball balloon. The third one, introduced for the 2014 parade, has Pikachu wearing a green scarf and holding a small Pikachu shaped snowman. Pikachu is the only core series starter Pokémon with a pre-evolved form, though Pichu was not available in Pokémon Yellow. 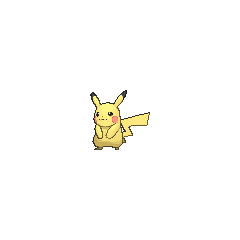 Pikachu is the only core series starter Pokémon that is not Fire, Water, or Grass-type. As of Generation V, Pikachu has the most event-exclusive moves available to it. In the Japanese Pokémon Stadium, Pikachu is the only Pokémon that can be used in battle that is not fully evolved. In Pokémon Yellow, and beginning in Generation VI onwards, Pikachu uses its cry from the anime as voiced by Ikue Ohtani. Pikachu is the only Pokémon that uses its anime voice in any core series game. In all of these games, Pikachu's cry upon entering the field is not the same cry played in its status or Pokédex screens. If the starter Pikachu from Yellow is transferred to Pokémon Stadium or Stadium 2, it will also use its anime voice. Black, White, Black 2, and White 2 are the only core series, handheld games in which Pikachu is not available in some way, although it makes a number of cameo appearances including as an NPC. Of all the Pokémon that were given increased base stats in Generation VI, Pikachu is the only one that received an increase to more than one stat: its Defense and Special Defense. Pikachu's number in the National Pokédex and the Alola Pokédex are the same: 025. Pikachu has physical aspects of several species of rodents, and its category suggests that it is based on a mouse. It is not particularly similar to the pika despite its name, but its long ears do resemble those of other members of Lagomorpha. 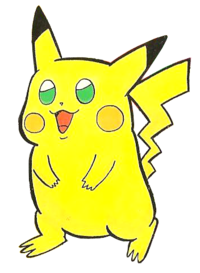 Pikachu was designed by Atsuko Nishida, a member of the core design team at Game Freak. Pikachu is a combination of ピカピカ pikapika (onomatopoeia for sparkle) and チューチュー chūchū (the sound of squeaking). Indonesian Pikacu (Pocket Monsters only) Corruption of its Japanese name.